Even after finishing Timmy Failure I’m not quite sure what I think about it. Piggybacking on the success of the Diary of a Wimpy Kid series this book is an odd sort of mixture of Diary of a Wimpy Kid and my all-time favorite comic strip Calvin and Hobbes (about a delightfully incorrigible boy and his stuffed tiger–who is alive for him). Timmy has a polar bear instead of a tiger. The drawings are the sketchy stick figure-type comic drawings and the humor is often snarky and sarcastic with verbal sparring and slapstick that result in laugh-out-loud moments during reading. 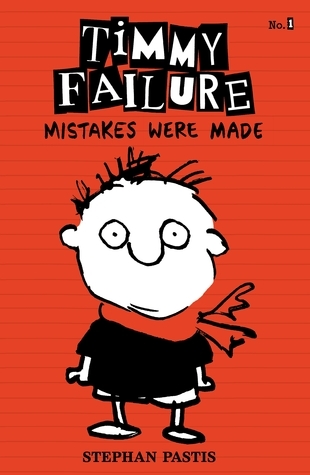 My guess is that kids who like Jeff Kinney’s Diary of a Wimpy Kid, Lincoln Peirce’s Big Nate series, or Jim Benson’s Dear Dumb Diary series will find Timmy Failure a funny, enjoyable read. There are several genuinely funny moments in the story. I will be interested to hear reactions from kids once they have read it, as I think some of the sarcastic humor between Timmy and his mother seems to be aimed more at adults than the children for whom the book is intended. It is the first in what appears to be a series. The author–Stephan Pastis–has formerly written exclusively for adults. As the series progresses in style and character development it has the potential to get funnier and funnier (in much the same way Katy Kelly’s first Melonhead book is mediocre with potential and the ensuing 3 Melonhead books are hysterically funny).